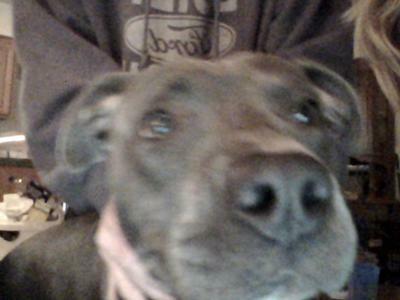 Bella is a blue pit bull. I came across her picture after she had just been born and it was love at first site. I wanted to buy her for my husband. He had never had a dog not even as a child. What better breed to be your first pup? She came from Kentucky. The guy that had the litter would not sell to stranger but by luck I knew his nephew. Bella is akc but honestly even if she hadn't come with papers and was a mix I still would have wanted her. I fell deeply for her! When she was old enough to leave her mommy the man drove from Kentucky to Maryland to bring her to me. he said ever since she was born she was the calmest pup he'd ever seen. Plus Bella needed to be cuddled at all times which was great for us. Yes we are those type of people that sleep with our pets. They are treated as if there any other family member here. I got her chew toys and trained her with tricks right away. She's been the most easy dog to train to very very smart. I had a pomerian so that's why I got Bella for my hubby. Bella also loved my pom but after three months of having Bella my neighbor's pitbull attacked and killed my pom--which i never felt like because it was a pitbull. That's why I believe in owner irresponsibility. If their dog was animal aggressive he should not have been running free, muzzle or at least on chain. after this happened I got extremly protective over Bella and that put my on the course to learn any thing and every thing about pits. Now one day when we get a new house with little more property my dream is to take in rescue pitbulls and let them live the rest of there lives with my family who cherish them and who now fully understand the breed. Ro be honest I probably wouldnt own another breed now espically after seeing the kind of love bella gives out. She's a year old now and not one time even as a playful pup has she showed a sign of aggression. I have been an arguments with family members and strangers who see Bella and claim pitbulls are bad news. I will fight for this breed and do whatever it takes for people to see what great dogs they are and how its the owner that makes the dog. 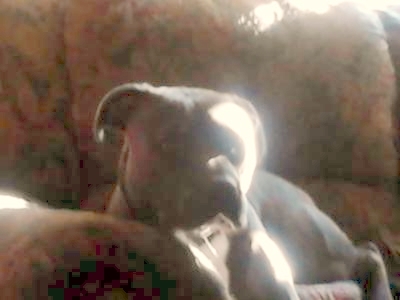 I hope to own another pit soon but this time I will help one that needs a home or thats been abused. But I can say Bella would change even the hardest headed person's mind about pitbull dogs. She has a way of looking to you with these eyes that make you instantly fall in love with her. I agree with you 100%. I have 2 pit rescue mix dogs. My male is pit and dobie and my female is pit and lab mix. We have to tuck them in everynight with their blankets. If we dont they will just sit there and look at us as if to say Im waiting.. I wish more people would stop saying that Pit Bulls are bad dogs. I love your story I got 2 female pitbulls and a mix white deaf boxer. They are so good to him they love him unconditionally. My dogs are my world I have always had pitbulls my whole life and to me they are the best breed ever. My dogs sleep with us too they have been doing it since they were puppies. They wouldn't know what to do if they ever had to sleep somewhere else. My Husband was afraid at first when we first got our first pit and now he loves them and wouldn't trade them for anyone of anything. We love our dogs like if they were our kids. I always protect them and make sure they are always save wherever we go because of how people are towards them. If I had money and land I would open up my own pitbull rescue center too. I'm glad Bella found a great family and hopefully you will find her a great companion too. God Bless you and the babies !! I have a page on this site related to my foster dog, Tugger. She's from our local shelter and they are now asking me to have her euthanized. Tugger had been at the shelter for 3 mos. and it was stated that she was "depreciating". I had spent enough time with her to know that she was capable of being a sweet, loveable dog. I took her into my home for this reason and I was right. She is my shadow and always has her tail wagging and thanks me with tons of puppy kisses. Unfortunately, Tugger either didn't receive a lot of socialization or was abused. She has moderate fear issues and is tentative when meeting new people. She is very slowly warming up to my husband, but she barks/charges him whenever he comes thru the door or out of our bedroom. Additionally, she wants to eat my kitties. For this reason, she had to go back to the shelter. I am now in a desperate search to find a knowledgeable foster home willing to provide her with training. I've reached out to a group in Chicago and I'm praying that they'll take her. It is her last hope. Tugger has changed my view about pit bulls and like you, I have researched, read tons of books and watched more movies than I can count so that I have a better understanding of the breed. I'm so glad that Tugger came into my life because I know the purpose is to help educate people on what a wonderful breed this truly is. Remarkable, I have met more people who have owned and loved the breed than those who are fearful. This gives me hope. Thank you for what you are doing and for sharing your story.